Wall Street – Every dream has a price. Screenplay by Oliver Stone and Stanley Weiser. I have always considered this to be one of my favourite movies. Oliver Stone provided a fantastic look into high finance and let us look behind the curtain at corporate raiding. 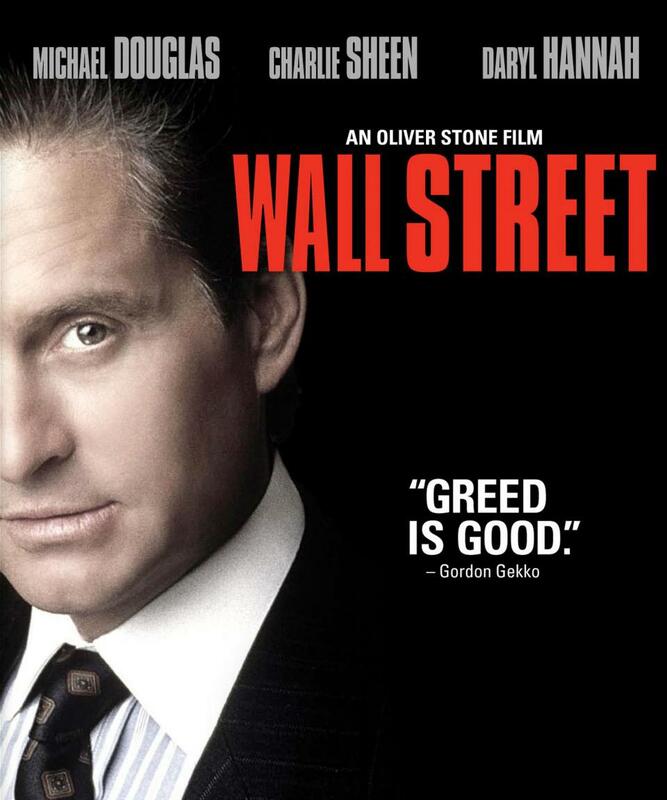 Bud Fox (Charlie Sheen) is driven to make it big as a broker in New York on Wall Street. He is struggling with his current client list but still he perseveres. He has been hounding the biggest whale in the ocean of finance…Gordon Gekko (Douglas) and the daily phone calls he makes are not being answered. He gets a hold of Gekko’s favourite Cuban cigars and gives them to Gekko on his birthday. He waits most of the day for their meeting and finally he is allowed to meet face to face with his idol. Bud Fox impresses Gekko but not with his financial prowess. In his desperation to impress Gekko he gives up information on the company where his father works. This is what Gordon Gekko does to perfection…he wants information that will guarantee results. Bud gets caught up in his new lifestyle and loses himself in the process. He starts dating Darien Taylor (Hannah) an interior decorator with impeccable taste. He calls on his old friends and uses some questionable tactics to get the information he needs to keep impressing Gekko. As he gets deeper the risks get bigger and when trouble arises he has signed documents that will keep Gekko out of trouble. There are some great performances by Hal Holbrook, John C. McGinley, Martin Sheen, Charlie Sheen, and Terence Stamp, but it was the performance by Michael Douglas that stood out as best. He was incredible during every scene he was in and that is why he took home the Oscar for Best Actor in a Leading Role. This is a brilliant movie by a great director who also co-wrote this movie. Directors’ Previous Movies: Talk Radio, JFK, Savages. If you liked this try: Boiler Room, The Pursuit of Happyness, Other People’s Money.